When you buy meat and poultry, its freshness and safety is probably your number-one concern. Unfortunately, few of us have confidence in the "sell by" dates on package labels. And relying on appearance and smell can be deceiving — especially when inert gasses are added to meat packages; they extend the appearance of freshness and add confusing odors. 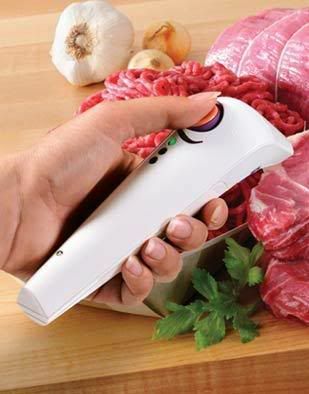 The revolutionary SensorfreshQ™ is an affordable, portable, handheld electronic "nose" that uses leading-edge food-safety technology to quickly measure the bacteriological activity on uncooked meat or poultry. Its sophisticated micro-processor takes over 2,000 readings in under one minute and through complex algorithms, determines the food's safety — a green LED means it is safe; yellow means okay but eat within a day; and red signals that freshness is no longer assured. So if you're sick of smelling the meat that's been left in your bottom crisper for too long and you're never sure if you should go ahead and cook it or not, this may be just the investment for you. Personally, I say when it's green and fuzzy, that's too late, but anything before then, go for it.....but I'm not everyone, lol. It can be found here for a lovely $49.95 plus shipping....but it 'was' $89.95, so what a steal! Hehe.